To celebrate the re-launch of our newly designed website, we’ve teamed up with Pop Up Restaurateurs and all-round good guys, Terry & George. 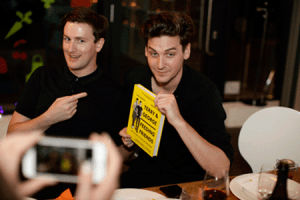 The duo are made up of chef Terry Edwards, who has trained and worked under Michelin-starred chefs including Paul Heathcote, Michel Roux Jr and Mark Hix, and George Craig, singer in indie band One Night Only, occasional Burberry model and foodie. 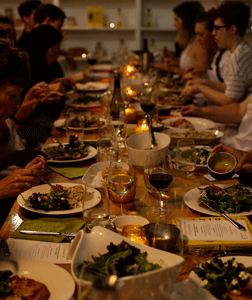 Between them, they put on sell out pop up events combining food, music and a relaxed, fun, intimate and friendly setting. 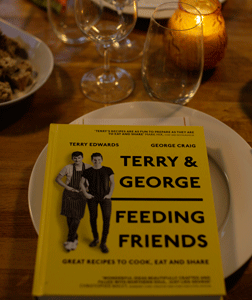 We’re giving away five signed copies of Terry & George’s brand new cookbook ‘Feeding Friends’ (which includes the delicious Creamed Spelt dish they served up at our dinner last week) so that you can enjoy some of Terry and George’s dishes for yourself. To be in with a chance of winning, simply retweet one of the prize draw competition tweets we’ll be sharing on our @WhyWholeGrain Twitter feed between Friday 7th October and Thursday 13th October. Good luck everyone! Terms and Conditions are below. Follow @WhyWholeGrain to keep up with our latest blogs and recipe inspiration. We aim to show that healthy eating doesn’t have to be boring! Look out for a very special video coming soon; with Terry & George giving their top tips for enjoying whole grains… watch this space!